Nod’s first Listener, which I think makes it the sixth puzzle this year by a debut setter. And I immediately warmed to Nod … a nice short preamble told us that extra letters would spell out some advice which must be followed. A good start this week, getting 1ac [S]ARUM, 11ac HO[F]+HS, 12ac T(O)R(N) + [P]ACT and 13ac RORIC (choice with R [F]OR IC makes chore). Then a horribly long gap before RECIPROCALLY at 32ac. Five acrosses, followed fairly quickly by a paltry five downs! Nonetheless, they gave me a good start on the puzzle, and getting 10ac DESENSITISER (which on my first pass I hurriedly thought was desensitises but couldn’t see the wordplay), well that certainly helped. So now for the advice: Shift first letters of the clues for more advice. Oh-oh, this looks like it could turn into Loda’s ‘In Clue Order, On and On’ with its endless messages! 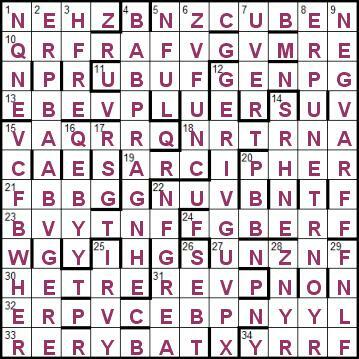 I listed the first half dozen letters of the clues and shifted them backwards and forwards half a dozen spaces. Nothing looked promising for a second message. Perhaps the letters would alternate between going forwards and backwards or would go forward 1, 2, 3, etc in turn. I used a spreadsheet with some simple algorithms built in. It took about half an hour. And of course, without doing anything fancy I found that, if I had persevered, the second message would have quickly revealed itself with a letter shift of 13: Shift a row by thirteen then highlight in purple. I also checked rows 7-12 in case another message was to be found saying IGNORE ROW SIX, but there was nothing. The Caesar Cipher is probably the simplest of all ciphers, whereby each letter is encoded by that which is a given number of letters forwards or backwards. So, a nicely entertaining puzzle from Nod. Although it had the same theme as a recent Samuel puzzle in Magpie, that did not detract from its enjoyment. Who said that a theme can only be used once? Not me. Look at the down clues! They produced rather an odd set of initial letters: URAUVTUYVTUGVACHECYR Definitely something rather fishy there, that wasn’t a statistical display of ETAOINSHRDLU! Well, highlighting the instruction and looking at openings of clues was not going to get the numpties far, so we began our solve. The first clue to yield, ‘Balkan waters a wild cherry (6) produced a conundrum. It looked to me as though the six-letter word AEGEAN was actually losing a letter in the wordplay A + GEAN (Yes, I realize now that A represented ARE but had to work back to that when solving was complete!) This looked daunting! Fortunately, a couple of long anagrams gave up their secrets. ‘Reflexively playing piccolo rarely (12)’ was a generous gift to solvers. RECIPROCALLY went in, with an extra O and we learned a new word with ONOCEATOR ‘Unnatural clone outran hybrid (10)’. 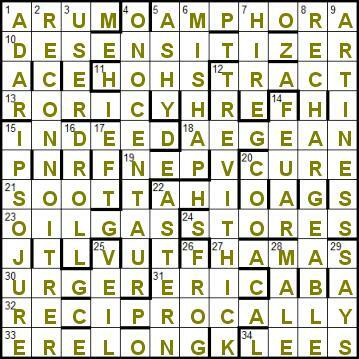 A number of clues had us puzzled and unsure of the extra letter, especially those where we the clue led us to a shortened word that still had to produce the extra letter, like ‘Addict almost free from danger rising (4)’ USER fitted the slot but we had to work backwards to find that RESCU(E) was ‘almost free from danger’ – reverse that for our USER and find an extra C.
“Bedtime!” I muttered and crept away to puzzle over the extent of the shift somewhere where they wouldn’t shame me by doing it in their heads. Writing out a couple of (double) alphabets and sliding them along like a slide-rule until I found a suitable fit (of course ABCD… = NOPQ… – should I have guessed that from the word ‘Toga’ that was leading me to a Latin source?) and I was soon able to decipher, SHIFT A ROW BY THIRTEEN THEN HIGHLIGHT IN PURPLE. 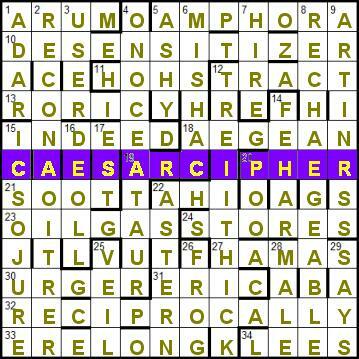 It was obvious which row had to be enciphered and sheer delight, as midnight approached, to see CAESAR CIPHER emerge. Only one problem remained; even Spud’s Rubick’s cube didn’t lead to the purchase of a purple highlighter. I hope my superimposition of pink on blue will suffice. Many thanks to Nod for what I believe was a debut puzzle – great fun. Back in May we had the apparently new Listener setter Nudd (Cross-reference) and now we have Nod, another new setter or is this Duck going retro? I shall look out for Nadd, Ned, Nidd and Nyd to complete the set. Nadd Ned Nidd Nod Nudd Nyd sounds vaguely familiar to me. 27ac Egyptian Muslim offshoot possesses enthralling soul (5) Hamas + E – AM[E] in HAS The wordplay is clear enough but I needed to confirm the definition and this was readily done via Google and Wikipedia. But how would those without the Internet fare? I could have visited the local library but happen to have the 2002 Encyclopædia Britannica on DVD where it states that Hamas was an offshoot of the pan-Arab Muslim Brotherhood. In the current online Britannica this has been changed to the pan-Islamic Muslim Brotherhood. I would conclude that Egyptian members of the Muslim Brotherhood were instrumental in the foundation of Hamas. 12dn Traction engine getting old replaced by current, stupid engineer (10) Trevithick + R – I for O in TREVO[R] + THICK Is there a traction engine called Trevor? Indeed there is and I probably met him some fifty years ago in the pages of the Reverend Awdry’s Thomas the Tank Engine books – it was a pleasure to be reacquainted. Shift first letters of the clues for more advice. Shift a row by thirteen then highlight in purple. 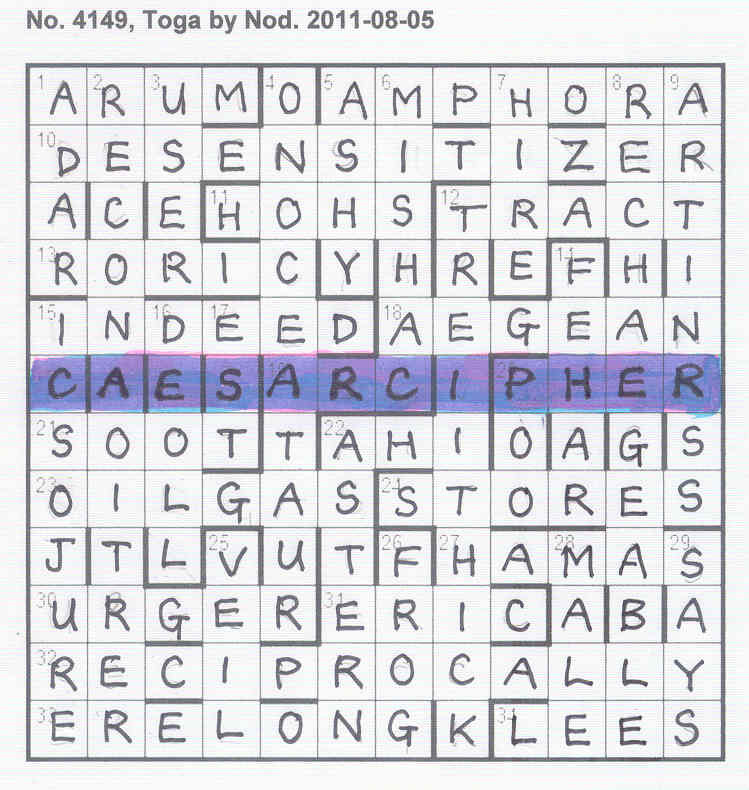 It does not appear in Chambers but the Caesar cipher is very well known and is probably the easiest of codes to crack. Nevertheless, it does have a current use on the Internet with ROT13 being used to conceal spoilers etc although I have never seen it. One notable shift is the one-letter HAL to IBM, with reference to 2001: A Space Odyssey, although we are told that this was nothing more than a pure coincidence. As a possible explanation of the title I offer that, in the clothing sense, a toga could be considered to be a shift – a Roman shift of four letters perhaps. To conclude, this was a straightforward but entertaining debut. I certainly enjoyed the research it inspired so thank you Nod. As a postscript, you will see above or below just how much code my co-bloggers at LWO have written – I resisted the temptation. Now let us check out George. Initial reactions to this one were mixed. The Magpie indeed! We know what to expect from those clever clogs. The current Magpie is sitting in front of me. We have solved one puzzle (but it is still current so ST SH or whatever those ‘hush’ abbreviations are). The Magpie ratings go from A to E with A being occasionally manageable, C about average Listener standard and E just what you need if you fancy a week or two in an institution for raving lunatics (don’t know what the current PC expression for that is). Magpie No 104 has as its 6 puzzles this month A,D,C,D,B, and D – yes, that averages out as C (the MEAN – see 16ac, is C) so we might as well have a shot at this. Next reaction; a delighted guffaw as we study the preamble – so they are a brains trust with a bright spark a clever clogs and a smarty pants. 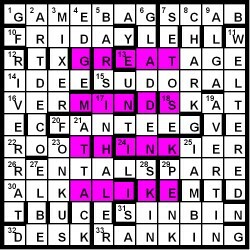 Seriously, though; we have 35 clues here and an 11 X 11 grid. We are going to change 35 letters in that grid to replace a portion. We can’t be working on the perimeter or diagonals so it is going to be a 7 X 5 or a 5 X 7 rectangle in the centre. The preamble is clear. We have to complete the bright spark’s grid, so we set to work. That initial fill is not over-difficult though we have a few places where the unnecessary letter in the clue doesn’t leap out at us. ‘Technique of colouration foxy animal goes over (4)’? This seems to suggest TAKI reversing to IKAT and our likely culprit is that ugly U in the middle of colouration, but what’s that ‘foxy’ doing? Does a reddish-brown horse become ‘foxy’ or are we in a mess here and is ‘foxy’ a lovely new anagrind? LATERAL or LITERAL at 15ac? (As it turned out, this clue and the obscure VERGES and even a hint of doubt about ALKENE didn’t matter – luckily for us!) We understand now that ‘Rival dropping first pass leaves one taken aback (7)’ gives COLLATERAL dropping COL or ‘pass’ but I am unable to see what that has to do with ‘one taken aback’ – but it did give us that A in [A]back. Similarly, ‘Means to forget as is going slow (6)’ Means are averages, and we can forget As (two of them) so we get VERGES but how is that ‘is going [S]low’? Puzzled nudniks but we had an almost complete grid and, encouraged by the fact that yet another set of Listener compilers seemed to indulge in the traditional alcohol, this time with the fascinating new way of becoming inebriate[D] ‘What rueful linguist admits becoming inebriated (7)’ (FULLING hidden), took a pause for a single malt, then attempted to fit those 35 letters into our grid. 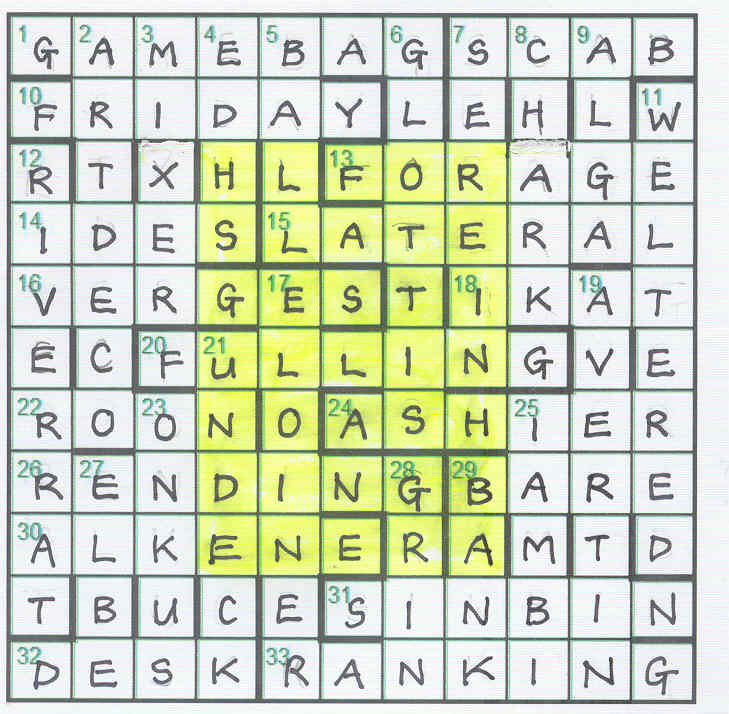 Copying all the bars correctly into my working grid would have saved me a good half hour of floundering – that was our red herring this week as we were hunting for odd words like SETOSEL and MATTACK. However, the problem was finally resolved and we were left with realising what the smartypants had seen. Great fun, this one and nowhere near so difficult as we had originally feared. Of course we are left with a sense of admiration that these bright sparks were able to see that there were three different ways of completing that central section. I hope we’ll get a setters’ blog explaining how it was done – did they work backwards? Thanks to the Magpie clever clogs for a pleasant romp. I didn’t blog the last puzzle by The Magpie since that appeared (in 2008) before my LWO duties began. I remember that it concerned three people Clever Clogs, Smartypants and Bright Spark, although their names were only discovered during the solving of the puzzle. This time we were told that a bright spark, a clever clogs and a smarty pants were colluding to solve a Listener … that’s three heads rather than my normal one. Not only that, but this week we had a puzzle set by The Magpie, who is actually two of the most fiendish setters that the Listener arsenal has to fight us with! So that’s two setters who are pitted against me, and I’d better be ready for a tough time. The good news was that it was a smaller than normal grid, 11×11. The bad news, that we had to solve the puzzle using the given clues, remove an ‘unnecessary’ letter from every clue so that it still gave the same answers, and then use those letters to give another grid with loads of new entries. More changes would then be required to make even more new words and the reason that the three brainboxes all got the same solution. Which of the two ‘Magpies’ dreamt that idea up, and what drug was he on at the time?! I started on the clues expecting to get precious few in my first pass. In fact, it wasn’t too bad. 7ac SCAB (with a superfluous p in pact; 14ac IDES (superfluous t in this); 20ac FULLER (inebriated); 31ac SIN BIN (stripping) and 32ac DESK (laying). Not many acrosses, but encouraging, and great fun. Only four downs unfortunately: 7 SEREIN, 8 CHARK, 21 UNDECK, and 25 IAMBI. About an hour into the solving process and I reread the preamble: the reason why they all arrived at the same solution consisting of twenty cells. Well, great minds think alike looked like a good candidate. Four words, each of five letters, how symmetrical. Not that it helped me at all in clue solving, but it might make stage two or three a bit easier! Most of the superfluous letters were indeed superfluous, but there were some instances where the original clue wasn’t quite right. However, the puzzle was eminently solvable, and the clues must have been a real pig to create … one of those cases where knowing where the extra letter was made it look much easier than it must have been when sitting in front of a blank sheet of paper. The only clue that caused me real problems was 16ac Means to forget as is going slow (6). It seemed likely that the letter s was superflous, but which one? It could be in Means, as (with a word for ‘means to forget’ losing an a), is or slow. Alternatively, it could be the t in forget! In the end, of course, I kicked myself. Good old Means gave AVERAGES, with both a’s being forgotten, to give VERGES, meaning going low, ie sloping downwards. Phew! Solving all the clues took just under two hours, but considering there were only thirty-five of them in this smallish grid, I felt that was a pretty poor show. So on to stage two, which involved fitting all these superflous letters into the grid to create a brand new one. 35 letters, so presumably a 7×5 block to be replaced. I chose the one occupying rows 3-9 and columns 4-8. I decided to create a grid with that central area empty, but half expecting to have to draw it again with the rectangle going across the centre of the grid … or perhaps not central in any way, but I suspected that was unlikely. ALKENE in row 9 was a good start as that could become ALKALI. I then wondered if the central word FULLING would be replaced by a word not ending in -ING. I have to confess that I then cheated a bit, and fed F•••••G into a little bit of software that some of us have! Out popped FANTEEG, and marking A, N, T and two Es off my list of extra letters, I noticed that they appeared there in sequence (the last two across clues and the first three down). Lo and behold, these superfluous letters could all be used in groups of five to give the stage two grid. Amazing! Each clue had to have a specific superfluous letter! Moreover, every letter in the new grid is different from its original. This was an incredible puzzle. A brilliant idea, superbly implemented, and great fun to solve. Well done guys, and I look forward to even more collusion by the Brains Trust in the near future.